This bass solo from act IV of Verdi's Otello has been edited by Lawrence Hurst, former principal bassist with the Dallas Symphony Orchestra and Professor and chair of the String Department at Indiana University School of Music since 1986. Hurst's bowings, fingerings and other editorial markings have been added throughout the score. Verdi's Otello is a four-act opera based on Shakespeare's play Othello. Premiering in 1887, Otello was Verdi's penultimate opera. In this work, Verdi attempted to do away with the traditional recitative-aria structure of opera, similar to Wagner. Otello largely flows in and out of pieces more smoothly than in any of Verdi's earlier works. In addition, the orchestral writing is more highly developed than in previous compositions, becoming a major force the portrayal of the story and its characters, rather than simply a vocal accompaniment. 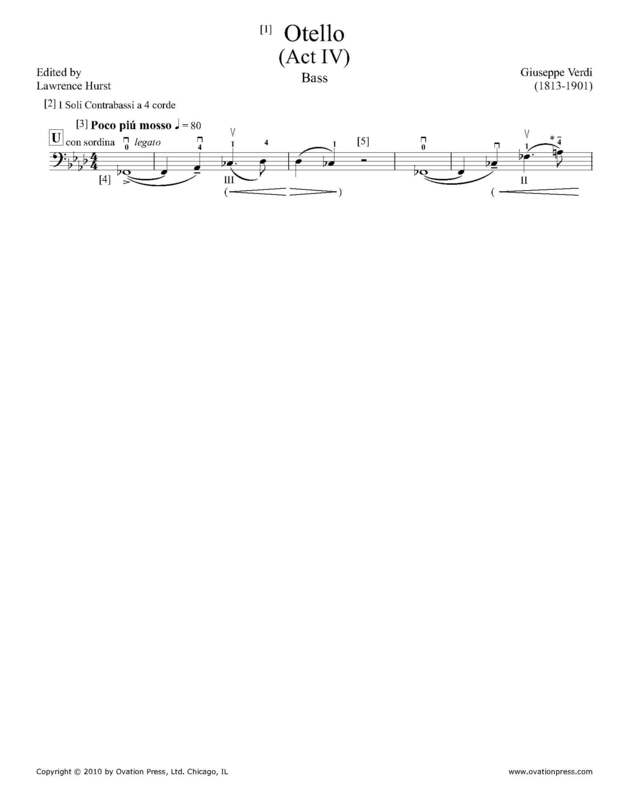 Download and print the score today to gain access to expertly edited Verdi Otello bass fingerings and bowings from Lawrence Hurst! Please note: This solo is edited in a comprehensive and detailed manner. Lawrence Hurst’s insightful performance suggestions are enclosed with this music. There is one page of music encompassing the bass solo from Act IV and one page of commentary and instruction.